At Hough Ear Institute (HEI), our mission is to restore hearing worldwide through research, teaching and humanitarian efforts. Our researchers focus on sensorineural hearing loss, exploring its causes, prevention methods, reversing its damage, and ultimately restoring natural hearing in the inner ear. To contextualize the importance of this program and our innovative therapeutic approach, it is important to first emphasize the way the inner ear communicates with the brain to perceive and interpret sound information. The brain, rather than the ear, is responsible for detecting sound. The cochlea and all the other parts of the entire ear are designed to convert sound into nerve signals and convey sound information to the brain for interpretation. With normal hearing, sound waves vibrate the ear drum, which moves the tiny bones of the middle ear. These bones carry the sound vibrations to the cochlea. The cochlea pulsates the basilar membrane, which contains thousands of sensory hair cells that move in response to the pressure created by the sound waves. Hair cells inside the cochlea are arranged into rows, one row of inner hair cells detects sound stimuli and three rows of outer hair cells function to enhance and fine tune sound sensitivity within the environment. The cochlear is shaped like a spiral staircase, and the cells at the base of the cochlear spiral, or the bottom of this staircase, respond to high-frequency sounds, while those at the top respond to low-frequency sounds. 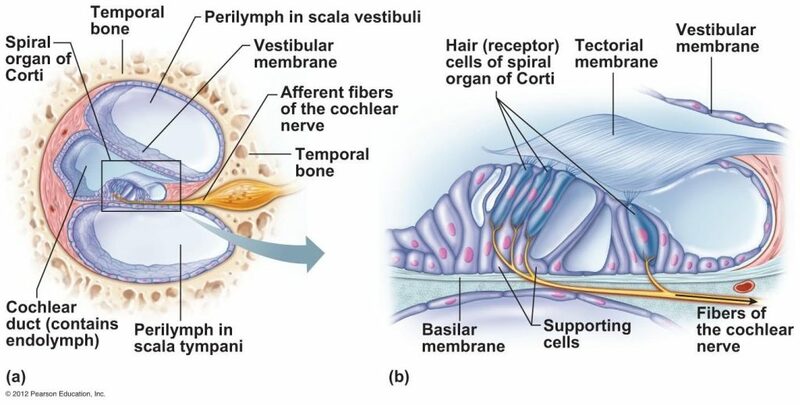 Each one of the hair cells within the cochlear spiral is connected to multiple fine nerve endings, called neurites, that send information to the auditory nerve (cochlear nerve). The auditory nerve is a line of nerve cells that reaches all the way to a part of the brain called the auditory cortex. When hair cells are stimulated by sound, they transmit a tiny electrochemical pulse through the neurites to underlying nerve cells, called a nerve impulse. When a nerve cell receives a nerve impulse, it initiates a cascade of nerve impulses that sends the sound signal to the neighboring cell which stimulates the next cell, and so on down the line until it reaches the brain, where everything comes together and all the electrical nerve impulses become an individual’s experience of sound. So what is sensorineural hearing loss specifically? Medical professionals have created three different classifications for hearing loss: conductive hearing loss, sensorineural hearing loss and mixed hearing loss. Conductive hearing loss refers to damaged structures of the middle ear, typically reversible through surgery. 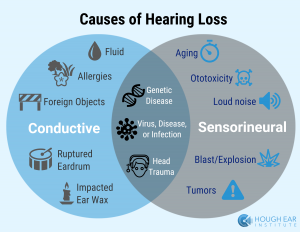 Sensorineural hearing loss, on the other hand, often means irreversible damage to the inner ear, specifically the death of hair cells within the cochlea or injury to the auditory nerve. Mixed hearing loss, as the name suggests, means a patient struggles from a combination of conductive and sensorineural hearing loss. Decreased signaling between hair cells and nerve cells associated with the cumulative loss or degeneration of fine nerve connections is a major cause of deafness and other auditory disorders, such as tinnitus, which describes the phantom perception of sound often perceived as a ringing or buzzing sensation in the ears. Hazardous and prolonged exposure to loud noise is one of the largest causes of SNHL and tinnitus; genetic abnormalities, viruses, diseases, bacterial infections, head traumas, drug or antibiotic side effects (ototoxicity), and aging are also major contributors. Most people have experienced some exposure to these conditions that can cause permanent damage, but modern medicine cannot offer an immediate preventative or regenerative clinical solution. This is a pressing issue because the majority (approximately 95%) of the auditory nerve connections are dedicated to inner hair cell signaling. 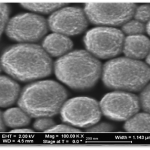 One of the difficulties in treating sensorineural hearing loss is the relative inaccessibility of the inner ear, and we are currently working on an effective and minimally invasive drug delivery system using nanoparticle technology. Hough Ear Institute has created silencing RNA (siRNA) technology that regenerates the inner ear hair cells destroyed by noise induced hearing loss. We are using silencing RNA technology to change supporting inner ear hair cells into sensory hair cells essential to hearing. Along with this, we are also working on restoring the connection between the auditory nerve and the hair cells that are disconnected when the hair cells die. We have both culture dish and live animal data that shows we can regenerate these fine nerve connections and reconnect them to hair cells for hearing restoration. In a clinical setting, this holds the potential to restore hearing function or reverse tinnitus disorders among millions of people whom currently have no viable options for achieving normal hearing. Our pre-clinical results reinforce the promise of this being a cure, but we require further validation for us to move forward with clinical testing. If our validation studies are successful, we will pursue FDA approval, since restoring hair cell/auditory nerve connections would treat the major underlying cause of tinnitus and SNHL. Currently, there are no FDA-approved treatments for either chronic SNHL or tinnitus, so our therapeutic approach has the potential to be a first-in-class drug for these indications. The use of antioxidants in preventing hearing loss has been a major interest of the HEI researchers. Dr. Kopke’s previous research on the effects of antioxidants preventing hearing loss caused by noise exposure, and the research of Dr. Robert Floyd and the Oklahoma Research Foundation on the molecular basis of the biological activity of antioxidants has lead to a highly productive collaboration between the two institutions. Research has demonstrated that a combination of antioxidants, when delivered shortly after exposure to a level of noise or blast, can prevent a process of cellular degradation that would otherwise result in permanent hearing loss. The potential clinical importance of these findings is enormous as blast related injuries have become a part of both military and civilian life, as we have experienced here in Oklahoma with the Murrah bombing. Historically, drug delivery to the cochlea has required surgical access to the inner ear, a technically-challenging process performed by skilled specialists. 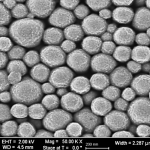 Based on our desire to make our medicine accessible to as many clinicians and patients as possible, researchers at HEI have begun developing strategies for simplifying the nanotechnology delivery process. 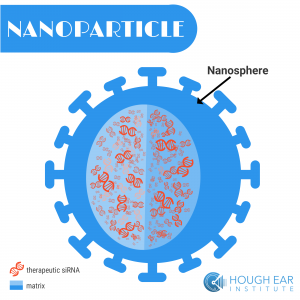 Nanoparticles are microscopic particles that can be created and programmed to target and deliver medicinal compounds to the inner ear. These miniaturized Trojan horses will not harm the sensitive tissues of the inner ear and are taken up by target cells in the cochlea for localized drug delivery. 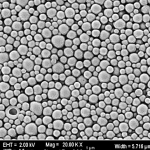 These sub-microscopic nanoparticles shield and protect our medicinal payloads (siRNA) until they get to their targeted site, and once there, they provide sustained and targeted delivery of medicine over a long period of time. A recent hearing loss concern is damage caused by certain chemotherapeutic drugs. People are able to beat cancer but often times at a high risk of losing their hearing. Over 70% of patients that use a specific cancer fighting drug suffer from severe hearing loss. This means that normal conversation is not audible and loud speech is difficult to hear or understand. This condition is hard to treat with hearing aids, because unlike glasses making things clearer for your eyes, a hearing aid only amplifies sound, it does not clarify it. Through vibration, sound causes the fluid within the cochlea to stimulate different areas of hair cells that differentiate the noise and stimulate the auditory nerve. When these hair cells die, your body can no longer hear clearly, and until recent years there has not been a cure for this kind of deafness. We are using nanoparticle technology to create a localized barrier that will protect inner ear hair cells during chemotherapy treatments without interfering with the drug’s ability to fight cancer. One of the aims of the research at HEI is to move the findings from the research bench to the clinic. Accordingly, the demonstration of the effectiveness of a combination of antioxidants on preventing hearing loss in animal models justified the funding of preclinical studies in humans and Phase I of FDA trials has now been completed. Our aim is to be able to obtain FDA approval within the next 3-5 years so that exposures to acoustic trauma both in civilian and military life need not lead to permanent hearing loss.